Lagos, Nigeria, 1974-79: The Funk & Disco capital of West Africa. More nightclubs, bars, spots and dance-floors than any place along the coast from Dakar all the way to Kinshasa. 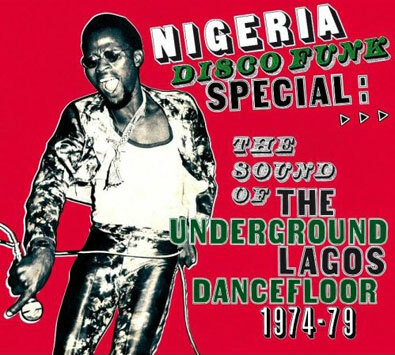 Nigeria Disco Funk Special is an amazing collection of heavy dancefloor grooves from urban Lagos in the '70s - hot and driving slices of Funk, Disco and Boogie that show just how vibrant the music scene was in one of West Africa's most populous and culturally diverse cities. In the '70s, it wasn't just James Brown who influenced the musicians playing in the nightspots of Lagos - the loose-structured and elongated jams that he was pioneering in America had been a part of Nigerian music much longer than that. This album is the sound of Cuban-heeled and Micro-minied Lagos youth soaking up the sound of the American discotheque and putting their own inimitable twist on the proceedings. The CD and Double Gatefold vinyl include rare tracks from famous musicians like Bongos Ikwue and Mono Mono's Joni Haastrup, as well as selections from cult bands like Asiko Rock Group, SJOB Movement and Jay-U Experience. Digipak CD with 16 Page booklet including original photographs and label scans plus notes by compiler Miles Cleret. Que dire sinon que je viens de prendre une véritable claque à l'écoute de cette sélection !!! Les morceaux du Sahara Band et du groupe SJOB Movement sont de véritables bombes de Dancefloor!! Tout le reste de l'album est fantastiquement groovy & funky comme ce absolument fabuleux morceau de Voices of Darkness mais surtout vous aller tous devenir fou sur l'ultime track du disque à mon humble avis : T FIRE " will of people" . Un morceau ultra funky , bourré de guitares wah wah accompagnés par une section de cuivres imparables !! Future HIT !!!! Alors bientôt il faudra pas rater le coche pour choper cet sélection vinyl !! Soyez vigilent et Ruez vous des que ca sort , car je pense vraiment que c'est la meilleur compilation afro funk de tous les temps !! et on peut savoir comment t'as fait pour écouter??? T'es pote avec Miles Cleret? ?